So as a clinical instructor I am often asked what type of stethoscope should the students invest in? Personally, this comes down to budget constraints, especially as a student. However, keep in mind that picking out your stethoscope is a pretty important decision. This will be one of your go-to tools in assessing your patients. I hate to sound cliche, but a patient’s life may depend on it. So chose wisely and carefully! Here are the one’s I personally have tried and the one that has been my work horse for over 15 years. My first stethoscope was a dual-tube Sprague Rappaport – I am pretty sure this is everyone’s first stethoscope? My mom gave this one to me with some other essential supplies like a pen light and bandage scissors. This was a first good stethoscope, although VERY heavy! It got me through clinicals, but it killed my neck by the end of the day and didn’t fit well in my pocket. But, it was free to me and I made it work. I usually tell students its pretty good for beginning assessments, and you can not beat the price! Littmann Lightweight – Light as a Feather! After my heavy dual-tubed stethoscope, I wanted something much lighter around my neck. As I went to the different hospitals, I started to notice that most nurses had Littmanns. So, I would ask around and the consensus was that this was the brand to get if you were going to invest in a stethoscope. Considering we didn’t have the internet back in the dinosaur age when I went to school, that was how you got “product reviews”. I still remember going to the Barnes & Nobles in Manhattan and getting the sticker shock when I inquired about the Littmann Cardiology stethoscopes. The nice worker (clearly a college student also) introduced me to the Littmann Lightweight and I was immediately intrigued – not only by the much more reasonable price tag, but especially how light it was! I bought it in a cute teal color and my neck had never been happier! Although I appreciated the nice light stethoscope, when I finished college and started working in an ICU Step-Down, I started to realize I was going to need much hardier and acoustically sophisticated stethoscope. But, overall, I like my Lightweight and still use it for community events! So, I might be a little bias, but I truly believe this IS the best stethoscope – don’t worry I am going to tell you why! I got my favorite stethoscope for my first Christmas after graduation in 1998 from my wonderful husband. 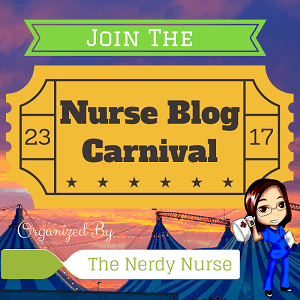 (What was funny – we graduated together and I got him a stethoscope also – nerdy nurse love for sure!) My Lightweight was doing pretty good, but was I ever surprised when I tried out my Cardiology III – all those breath sounds I had been missing!! I must admit, it was a bit heavier, but not as bad as the first one and I was willing to pay the price for quality. So, I continued to wear my stethoscope around my neck, like all the cool health care providers, however after a few years, I started to notice my stethoscope was getting more and more stiff. In fact, after about three years, it was no longer straight when I took it off my neck – it stayed curved – like a horseshoe. This brings me to one of the things I LOVE about Litmann – the warranty! The Cardiology III has a 5 year warranty, so I gave them a ring asking if they could replace the tubing. Not only would they replace the tubing, but they would give a good inspection and replace whatever needed replacing. And the bonus, my warranty would be extended! I was worried about sending my precious stethoscope away for a few days, however they promised the turn around would be quick. I knew I would have my Lightweight as back up, but who wants to drive a Civic when you can drive a Mercedes? So after my 3 – 12’s, I sent my stethoscope off and to my great surprise, I had it back with in the week! More amazing, it looked practically brand new!! I have since sent my stethoscope a few more times over the years and I still use it to this day – going strong since 1998! It truly is the best stethoscope and has yet to fail me. It is starting to get a little ragged and definitely could use another tune-up. Unfortunately, life got in the way and my warranty has expired. But, I did contact Littman directly to inquire if they offer repair services at cost. I was quickly emailed back that they do for just under $100 and of course, they will warranty the repairs for 2 years! Also, to my surprise, they have a trade-in program which customers can get 35% off a new stethoscope. As you can see, I am pretty partial to my Littmann Cardiology III – not only is it a fantastic instrument, but you can’t beat the warranty program! If you would like more information about their warranty or any of their other stethoscopes you can visit them at Littmann Stethoscopes. While you are there, check out some of the cool educational stuff they offer also! Do you have a favorite stethoscope? I would love to hear which one has not let you down! And don’t be afraid to hit the share buttons below – sharing is caring!! Thanks for visiting! Take care, be safe & wash your hands! NOTE: This post does contain affiliate links, but all humble opinions are all mine. Cardiac, Fun Stuff, Learning Tools, Respiratory, Student Nurses best stethoscope, Nurses, Nursing, nursing clinicals, Nursing students, patient care, stethoscope. permalink. While I’m certainly no expert, I’ve been using the ADC Adscope Convertible Cardiology Stethoscope all through clinicals and now as an RN. It’s considerably less expensive than the cardiology 3, and it’s worked out great. The reviews on amazon seem to be mixed between the two, but considering it’s 1/3 of the price, that’s a pretty good endorsement to me. Thanks for the input… I may have to check it out. Always like a good reasonably priced alternative for my students, thanks for visiting!! I too, always have a dilemma as to which stethoscope to recommend. I found this site to have a nice list of reviewed stethoscopes as well. It does list the Littmann Cardiology III at approximately $160.00, as the no. 1 and provides the buyer awareness on purchasing a faux Littman, and also lists Omron Sprague Rappaport at approximately $19.00 as the Best Buy and comes in at no. 2. So, it appears that you have been giving the best recommendations after all.